I have to agree with Jimmy on this one. It is a must for any horror fan. Audition followed by American Psycho. Does that mean if I go "Psycho" on my family over here... I can blame you all for putting me through the movies? 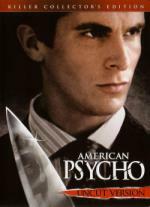 Patrick Bateman (Christian Bale) is a Wall Street yuppie, obsessed with success, status and style, with a stunning fiancée (Reese Witherspoon). He is also a psychotic killer who rapes, murders and dismembers both strangers and acquaintances without provocation or purpose. Based on the controversial novel by Bret Easton Ellis, the film offers a sharp satire to the dark side of yuppie culture in the '80s, while setting forth a vision that is both terrifying and chilling. After watching this one I am really not sure what to say about it. I think I may have been a little to tired when I started this one... as I have kept myself very busy all day today. So I did find it a bit on the confusing side and feel I will need to watch this one again at some point. But with that said I did enjoy what I saw here. It definitely kept my interest through-out the movie. In this year... Actor Tom Cruise and actress Nicole Kidman get divorced... All four major US networks air America: A Tribute to Heroes a two-hour telethon to raise money for the families of those killed in the attacks.... The Amazing Race premieres on CBS...24 premieres on Fox. I think the Final Destination sequels were all numbered and The Spirit Within is Final Fantasy...? No that is not right... it should be Final Fantasy: The Spirit Within. I guess I was still in a horror state of nmind when I typed that out. In The Bedroom is marvellous. Slow and serious, with a fantastic last act, you should put the effort into watching it, just to day you did. I dunno guys... I woke kinda in the mood for maybe a comedy... what do you all think of the movie Rat Race? Meh. Poor remake of Cannonball Run. 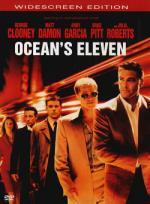 Now Ocean's Eleven on the other hand! Tons of fun! Ocean's Eleven huh?... hmmm... possibly. I want to watch a couple shows I recorded last night first. Then we will see what mood hits me. The plan is set. The rules are clear. If all goes right for Danny Ocean's grifters, the payoff is $150 million. Divided by 11. You do the math. The skill of Academy Award®-winning* director Steven Soderbergh combines with enough starpower to light up the Las Vegas strip in this classy caper. George Clooney plays Danny, defying the odds in a split-second heist of three Vegas casinos – all owned by a magnate (Andy Garcia) who is dating Danny's ex-wife (Julia Roberts). A fixer (Brad Pitt), a pickpocket (Matt Damon), a blackjack dealer (Bernie Mac), a flimflammer (Carl Reiner) and others in well-defined roles are with Danny. Are you in or out? This is the first time I ever seen this one. While I am not a big fan of George Clooney... He wasn't bad in this one. Though for some reason Julia Roberts didn't do it much for me here. She just seemed a bit stiff in the role. Not exactly relaxed... so not exactly believable. I also felt pretty much the same thing with Brad Pitt. But he is another one I never been a big fan of either. The movie itself I enjoyed quite a bit despite the problem I had with some of the main cast. It has a good, interesting storyline that easily kept my interest. I enjoyed it enough to look forward to seeing the sequel before too long. In this year... Spider-Man is the first film to make $100+ million during its opening weekend in the US unadjusted to inflation... The N, a digital cable and satellite channel aimed at teenagers, launches and shares the channel space of Noggin... The Dead Zone premieres on USA Network. I am not sure what I will do yet... but I may just face my fears a little and watch Eight Legged Freaks. We will see what I feel like when I want to pop one in. I enjoyed it enough to look forward to seeing the sequel before too long. I didn't like the sequel either, Jimmy. Shocked you liked the first one! But without Kathy sending it to me this is probably something I won't have watch, since those films aren't my cup of tea usually.